Anyone can do yoga. At Clay we believe that yoga is more than just an ‘add-on’ to one’s fitness program, it is a path into oneself; a path of self-discovery. A meditation practice that dates back to 2500BC, yoga offers a unique way in which we learn to calm our minds, tune into the messages of our bodies and challenge our limitations. To some, it may initially appear as though yoga were simply a means of stretching and relaxing. While those are definite benefits, there is more to this ancient practice. The word ‘Yoga’ literally means ‘to unite’ or ‘integrate’. It is a means in which we learn to unify our body, mind and spirit. The postures we practice are called ‘Asanas’, a Sanskrit word meaning ‘seat’ or ‘to sit with’, traditionally referring to meditation. At Clay, you can use your practice to cultivate calm focus and steady breathing while being physically challenged. As your strength and flexibility become more balanced, your ability to fully experience each posture increases and the mind begins to quiet. It is here, in the stillness of the present moment, that we can meet and begin to know ourselves. Your mat and your practice allow you to temporarily leave the rest of the world behind. Improve your balance, stabilization, flexibility, and core strength with a well-rounded yoga practice designed for the athlete community. Deep, conscious lengthening of the muscles will help relieve tension while the restorative poses will aid the body in the recovery process necessary after intense exercise. Yoga for athletes is an integral part of the regeneration process, greatly reducing the risk of injury, optimizing performance and helping maintain a vibrant, energized body. Let your mind go in this high energy flow class. A challenging, heat-building practice focused on continual, fluid movement. 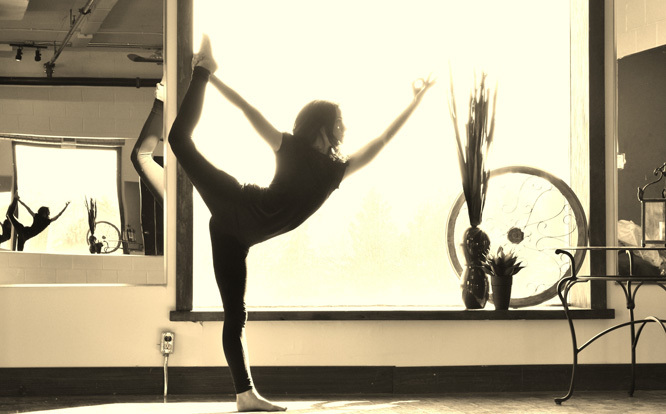 This creative flow class will get your body moving and is designed to be both physically and mentally challenging, while deepening your yoga experience. This class moves at a quick pace; therefore, some yoga experience is helpful prior to starting this class. Core yoga heals, detoxifies and exhilarates the body and mind with emphasis on movement, balance and intention. Core yoga is an advanced class which is a dynamic, challenging program that combines strength, flow and spirituality. Focuses on the fundamentals of hatha yoga’s basic postures, breath techniques and alignment. This flow moves at a slower pace to allow time for student’s questions and a deeper understanding of this dynamic practice. Ideal for beginners! An elegant, concise hatha yoga practice based on the universal principles of alignment. Each class has a theme with a meaningful connection to the spiritual purposes of the asana practice. The theme usually centers on cultivating a quality of mind or heart, giving direction to the energy that infuses every action and breath in poses. One of the world’s most widely-practiced forms, emphasizing correct alignment of all parts of the body within each yoga pose. This precision builds strength and stamina-balance and flexibility and a new sense of well-being. Achieving meditation in action, students learn to exist fully and vibrantly in the present moment. Restorative yoga is a gentle, calming, therapeutic kind of yoga that uses props to support the body as it eases into relaxation and balance. All levels are welcome including students working with injury, or sensitivity. Restorative yoga replenishes the body’s energy, leaving you feeling nourished, well rested and deeply rejuvenated. Let your mind go in this HOT high energy flow class. A challenging, heat-building practice focused on continual, fluid movement. This creative flow class will get your body moving and is designed to be both physically and mentally challenging, while deepening your yoga experience. This class moves at a quick pace; therefore, some Yoga experience is helpful prior to starting this class. The practice of Yin Yoga focuses on releasing the connective tissue of the body, which requires relaxing into each pose for an extended period of time. Yin is a reflective, gentle, and deeply effective practice using focus on the breath to help release myofascial tissue. An all levels class that begins with dynamic and invigorating Vinyasa sequences and ends with balancing and blissful restorative postures that help bring stillness and calmness to the body, mind and soul. Come and enjoy! Pilates is done on a mat using the resistance of one’s own body weight in fluid movements. It builds strength from the inside out, while increasing range of motion and re-balancing the body. This class will stretch, strengthen, tone and align the body while eliminating excess tension and strain on the spine and joints. All levels welcome.